This category will include oils on canvas, watercolors, silhouettes, samplers, school girl art as well as sconces and miscellaneous wall hangings. 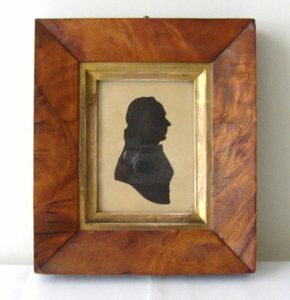 Very well done 19th C. cut and paste silhouette of a gentleman. Nicely cut details. Presented in a period figured maple frame with gold liner. Sight size 3 7/8″ x 2 7/8″. Overall size is 7 3/8″ x 6 3/8″. Excellent condition. A wonderful masterwork of African American Folk Art that visually and emotionally captures the tragic separation of black and white school children in out country in the mid 20th C.
This instropective and thoughtful painting was painted by “SAMATHA” and is dated “1958”, just at the height of America’s school integration struggle. 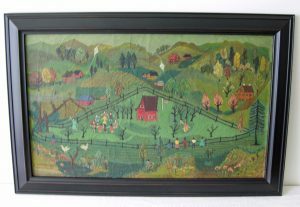 Samatha was not a trained artist, but used her experiences, imagination and natural artistic ability to create her folk art statement. The scene is cleverly and delightfully composed with great colorful details all across the canvas. It is set in an idyllic village school yard with the white children playing ing their school grounds with kites and games. In contrast, the black children are outside the fence with only the ability to look on and wonder. From studying the “story” of the painting and the detailed images, we believe the artist, “Samantha”, has carefully included herself at the lower center of her painting. You can almost feel her wishing she could cross the fence and join the fun. She has truly captured the moment in this most personal work. This special painting is in its untouched original state – no damage or repairs, no in-painting and never cleaned. If cleaned the images would be much brighter in color. 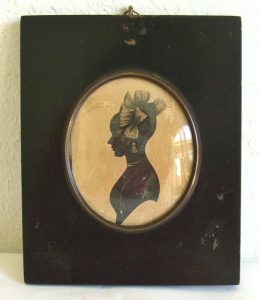 Attractive cut and pasted silhouette of a young woman with elaborate bows in her hair that are painted as part of the cut out. The figure is further embellished with bronze and black highlights. Very nice condition with some toning and rubs on the card, Silhouette is 3 5/8″ by 3″. Overall size is 6 3/4″ by 5 1/2″. Probably original frame. From a central NY collection.